Only three dull incisors remained in the lion’s mouth. His top right canine, chipped and half the size of the others, has long outlived its usefulness. All his teeth were the color of ancient ivory. A boil the size of a golf ball grew to the left of his crusty nose that not even flies would touch. His face was long and narrow for a lion, with hollows above his eyes, and when he turned around I could see every knot of his spine. At night from my tent I could hear what his body confirmed – he has not had a meal in days as he called out for his pride. Of all the lions I’ve seen in my life, and there have been many, this one has stuck with me the longest. From our guide we learned that he and his brother ruled Londolozi for many years. In his youth he wore a magnificent black mane, now still dark but lusterless from age. They both sired many cubs and had been together all their lives. They were even together the two times I saw them at the ripe old age of 17, an age unheard of in the wild. 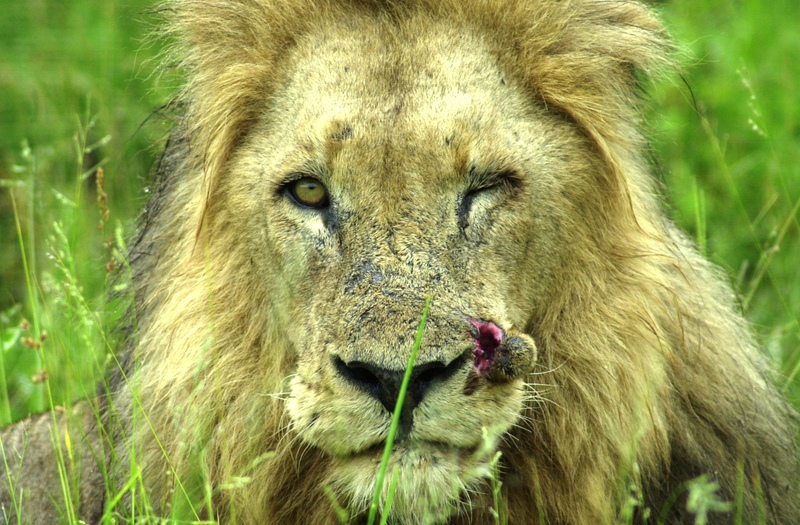 This is the honor denied to Cecil the Lion. Many people were disgusted by the shape that the two brothers were in. Their gaunt appearance was beautiful to me then and even more so now. Those deep set eyes told a history. Those yellowed teeth grew dull by ripping flesh, gripping napes of lioness necks and reproducing. They were allowed to age gracefully. Together. The last time I saw the pair, the healthier of the two (okay, I admit it, I named him Norton), gave a deep yawn before turning to face me. His mahogany eyes held my gaze before his left eye winked. In that wink I like to think we shared an understanding. I saw him for what he was – a graceful old soul that lived a long, fulfilling life. He saw me for what I was – someone appreciating that life. I’m a Heavy Hitter on Twitter!